Tonight, while cuddling our eldest son, I asked him if he needed any help getting gifts for his siblings for Christmas. "Well..." eight year old Andrew began in his slow deliberate manner, "I made a spear for Aiden. And for Annaliese..." a pause... "and for Ella." Immediately I remembered the apple tree suckers I had seen propped inside the kitchen door yesterday afternoon, ends whittled precisely to a fine point, and smiled to myself. "Ooookay... so we need to get something for Chase?" I asked him. "Would you like to buy something or is there something you have that you could give him?" 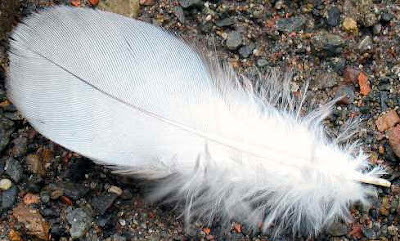 "Well..." he began again thoughtfully... "I did find a really nice white chicken feather..."
Sean and I were laughing over this tonight when I told him the story. Only Andrew would love a chicken feather and consider it a beautiful treasure worthy of passing on to his little brother. Absolutely love this boy of ours and his never ending wonder and appreciation of God's world. Finally heading to bed after gettingmy little Mr. Wide-a-Awake to sleep, and stopped for a moment at the computer. So glad I did, this is the sweetest post I have read anywhere in a long time! My then 2 year old wanted to make Daddy a gun last year. Couldn't quite figure out why I said that might not happen. I hope Chase likes his feather! This is so precious.... a must to write in your journal.